While the ideal way to treat teeth with decay (caries) is by removing the decay and placing a restoration (filling or crown), there is an alternative, non-invasive treatment that just received FDA approval, Silver Diamine Fluoride (SDF). Silver Diamine Fluoride (SDF) (http://www.elevateoralcare.com/dentist/AdvantageArrest) is a clinically applied treatment that controls active dental caries and aids in preventing further progression of the disease. SDF has a dual mechanism of action resulting from the combination of its ingredients. The silver component acts as an anti-microbial agent killing bacteria and preventing the formation of new biofilm, while the fluoride acts to prevent further demineralization of tooth structure. Application of SDF is simple and noninvasive. The carious teeth are isolated, kept dry, and all excess debris is removed. A small brush is dipped in a drop of SDF and placed on the lesion(s). Then, excess SDF is removed and patients are instructed to not eat or drink for one hour and are encouraged to avoid brushing their teeth for 24 hours after treatment. 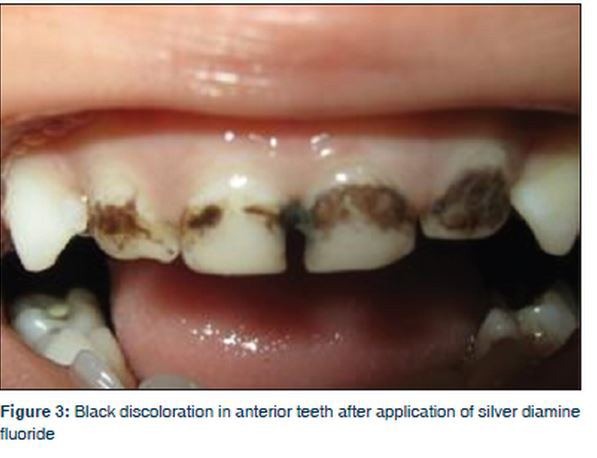 The only reported side effect is black staining of the tooth at the site of SDF application which is a common occurrence. This treatment will be applied to all of the affected teeth 1 to 2 times in separate visits (usually 3 weeks apart). 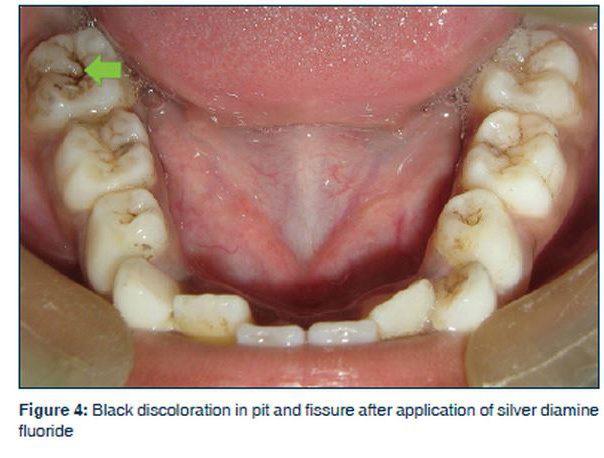 Once the decay is arrested (stopped), the tooth/teeth can be restored in the future if needed/desired.